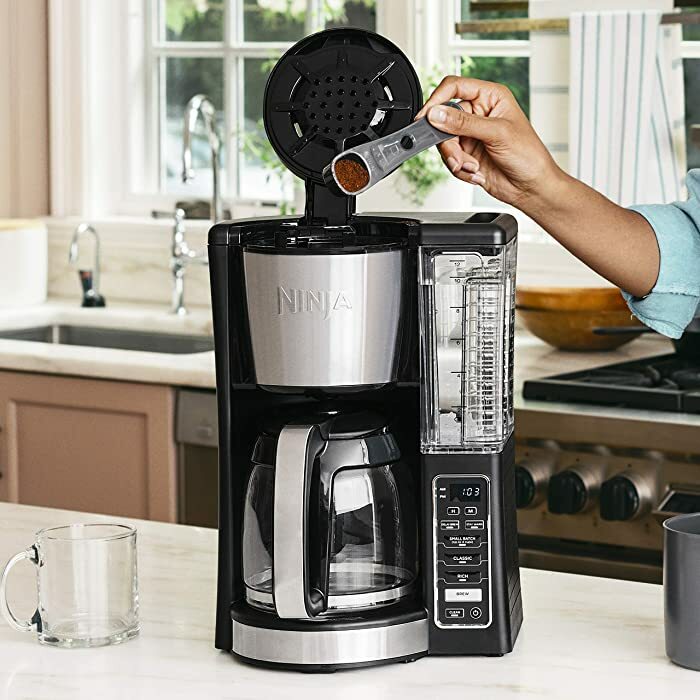 If you’re looking for the convenience of a single-serve coffee machine but you don’t want the running costs or environmental footprint of a pod-style coffee maker, Ninja comes flying to the rescue. Today, we’ll look at 5 of the strongest Ninja Coffee Bars in their impressive range so you can decide which, if any, would make the most suitable addition to your kitchen. The CP301 is not cheap but represents superb value for money. From tea to coffee, hot drinks to iced and cold brew, you’ll get 5 brew styles and 6 cup sizes meaning there’s something for the whole family in our overall pick for best Ninja Coffee Bar. A close second, the C112 is another classic pod-free coffee maker from the legendary Ninja. The onboard frother gives you the scope to make longer drinks as well as shorter espresso-style specialty coffees and you’ll get the convenience of a single-serve without the drawbacks and expense of pods. 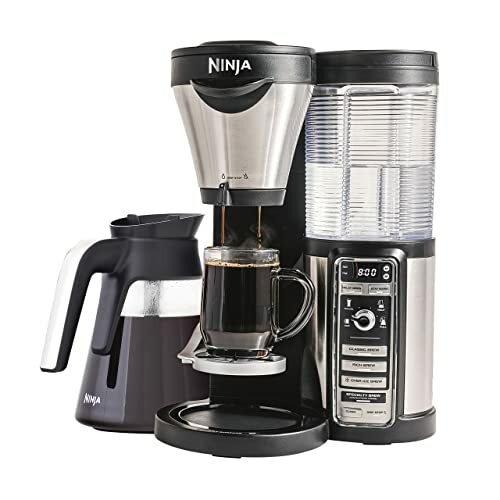 The CF091 is our best Ninja Coffee Bar if you’re operating on a tighter budget. You can still enjoy 5 different types of coffee from the one nimble machine and it features the Auto-iQ technology of the more expensive machines in a nifty, pocket-friendly package. Now for a bit more detail on the Ninja by category. We’ve chosen to approach things differently today since these machines are all broadly similar. We fully appreciate you’re only looking to invest in one of these Coffee Bars so it’s senseless to produce a batch of review where almost every aspect is the same. Instead, we’ll outline what these machines have in common before doubling down on the specifics and differences between the individual models. Design is always a highly subjective subject that polarizes opinion. Although most aspects of buying a coffee machine are personal, design is more so. The same black and silver look extends across the entire range and there’s a bit too much plastic on show to give a truly upscale appearance. If you’ve got a stark and minimalist kitchen, though, these Coffee Bars make a mean addition. There’s no right or wrong answer here and it very much hinges on how much importance you place on this issue in the first place. If you live in a small apartment and you’ve got limited space, the CE201 is by far your strongest option while if you have a sprawling house with ample room for all the appliances you need, pick from the entire range. You can’t examine any of these Ninja Coffee Bars without being confronted by the words Auto-iQ One Touch Intelligence. You might be wondering if this is just marketing jargon or whether it has real meaning. Well, it’s far more than just a buzzword. Of course, the one-touch part refers to the ease with which you can make coffee with these machine. An easily navigable menu with single buttons for just about everything you need means your coffee truly is just one-touch away. 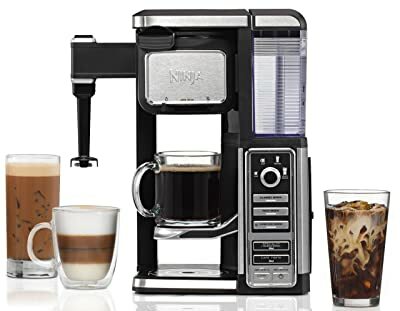 As far as intelligence goes, don’t expect AI with the Ninja Coffee Bars but you will get programmability on most of the models along with auto shut-off to ensure you don’t get any overheating or burnout if you forget your machine and leave it turned on. The Auto-iQ element comes into play after you’ve popped in your coffee and selected both your brew style – more on that shortly - and the size. It’s here that the Ninja Coffee Bars step in and do the hard yards for you. The machine will automatically pull down the precise amount of water needed to make the best version of any drink you choose. This means you won’t need to undergo the fiddly task of measuring out the water and you won’t be endlessly messing around with the reservoir. The size of these water tanks varies by model and we’ve drawn your attention to this within the individual reviews. Pod-style machines divide opinion, including our own. On the one hand, this type of coffee machine with single-serve capsules is incredibly convenient. Unfortunately, this is where the real advantages end. In terms of the environment, packages of coffee with multiple small pods all containing plastic that’s tough to recycle – and often ends up in the trashcan anyway – are obviously not good news. While some manufacturers are making all the right noises about large-scale recycling campaigns, bottom line, pods are not eco-friendly. Another significant drawback with pods is the relatively limited choice you’ll get. If you’re a real coffee lover, we’re pretty confident you’ll have a favorite blend. Are you just as confident this will be available in pod form? Only you can decide whether the taste of pods meets your standards. For us, they make serviceable coffee but it’s simply not in the same league as freshly ground coffee popped directly into the machine. And beyond all these downsides, pods are also pretty pricey. Sure, you can compare them favorably to the cost of hitting Starbucks every day but that’s hardly an equal comparison. It would like comparing the expense of eating at home to a restaurant meal, a little like comparing apples and oranges. With all that said, we’re not here to tell you what to do. If you’re a pod enthusiast, there are some great machines out there. If you agree with most of the above points, though, the Ninja Coffee Bars offer all the convenience of single-serve machines without any of the downsides of pods. We’ll touch briefly now on the 5 brew styles these awesome Ninja Coffee Bars deliver with the same consistency as your favorite coffee shop. The one word best summing up Ninja Coffee Bars on the performance front is choice. You’ll be almost overwhelmed by options. We say almost since the user-friendly nature of these machines along with a super-simple interface gives you the one-touch functionality so frequently mentioned by the manufacturer. The machines all offer supreme convenience without the drawbacks of pods and you’ll get a milk frother so you can expand your repertoire of drinks. 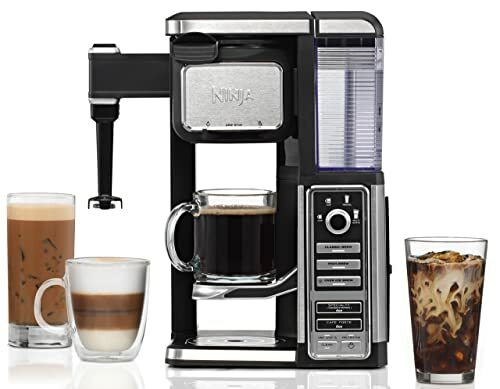 Some models extend scope to tea and iced drinks so read our Ninja Coffee Bar reviews to pick which one makes the best fit for you. Glass carafes allow to you to keep your eye on proceedings while heating plates on some models give you up to 2 hours of warming before you’ll need to make a fresh pot. 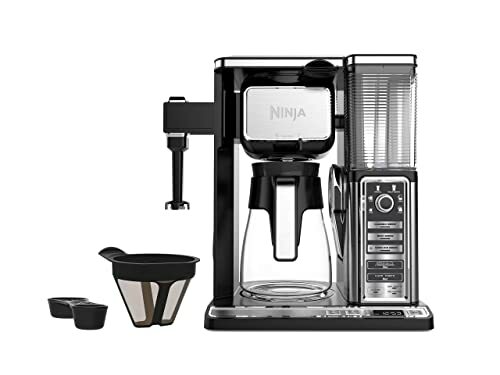 In summary, all Ninja Coffee Bars combine ease of use, programmability and first-class coffee in an extremely affordable machine so all that remains is to decide which model you fancy. To that end, we’ll highlight the chief differences that make each of these fine models stand out in a crowded market. First up in our Ninja coffee maker reviews is the pricey but powerful CP301. This is not especially cheap but the price/performance ratio is unbeatable. 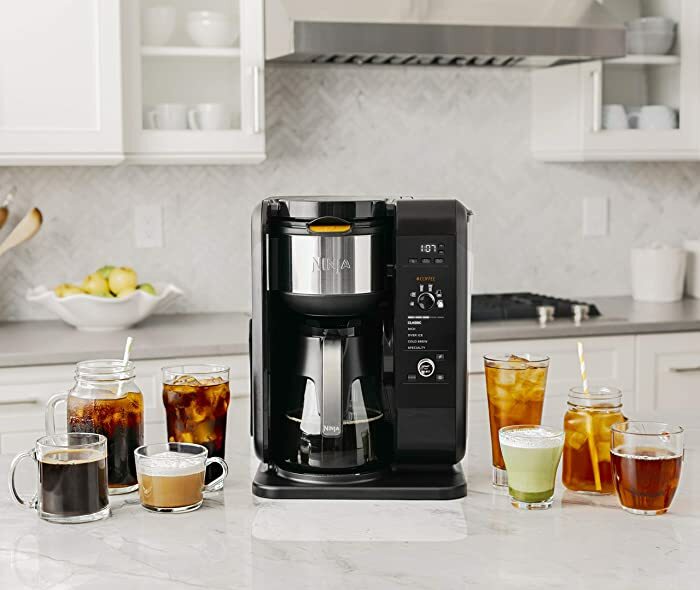 If you love hot and cold coffee but you’re also partial to the occasional cup of tea, this multipurpose machine is the obvious solution to an age-old problem. At the heart of the Ninja coffee machines is Auto-iQ but what does that even mean? In essence it’s just one-touch technology so all you need do is choose the type of drink you want and the size. Rather than needing to also fuss over the amount of water, what you need will be pulled straight from the tank meaning you need only focus on keeping it topped up and the machine will do the rest. You can choose from 5 coffee brew styles (classic, cold brew, rich, over ice, specialty) with the same options for tea. 6 cup sizes let you enjoy anything from a short shot to a travel mug and even a whole carafe. The milk frother allows you to enjoy far more than shorter espresso-style coffees – the specialty brew – and you can use your favorite ground blend in this pod-free machine. The frother folds away in a neat space-saving manner. If you prefer cold coffee, go for the on-demand version over ice or, if you’re fussier and prepared to wait, the cold brew coffee that takes 10 minutes but is well worth the wait. 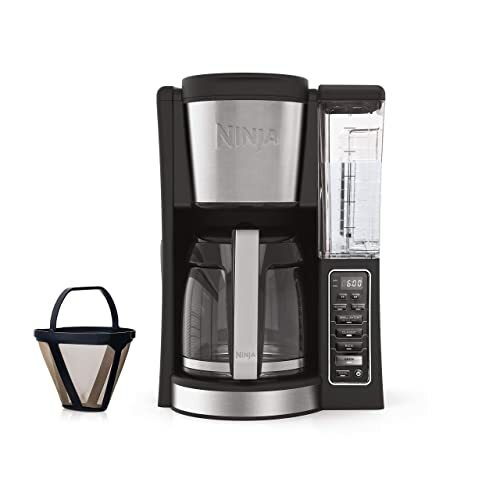 Perfect for large families with varying tastes in drinks, the Ninja Hot and Cold Brewed System is an absolute must and a flexible addition to the kitchen which happens to look great into the bargain. 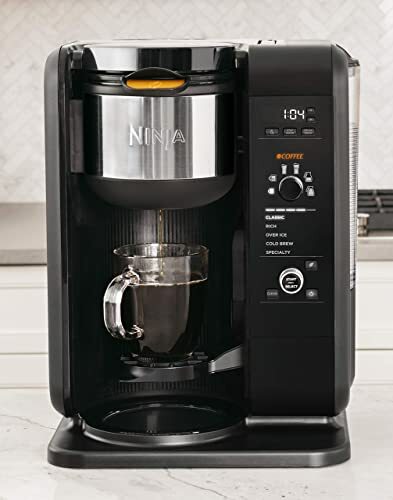 This single-serve Ninja Coffee Bar – known as the C112 – is another machine capable of delivering both hot and cold drinks. 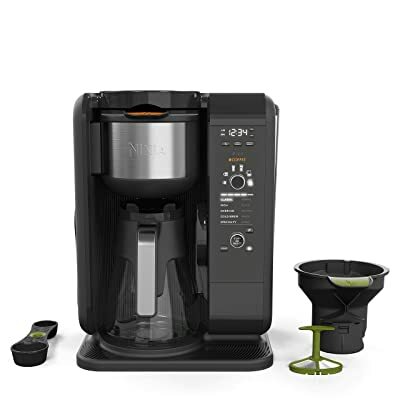 While this is by no means the most rapid delivery system if you’re looking for coffee in a hurry, you’ll be able to make very large 22oz cups which takes some of the sting out of making repeated smaller drinks if you’re a real coffee fiend. We’d alert you to the fact the hot drinks from this model are not exactly scorching. Bear in mind, too, that if you plan to add milk you’re likely to end up with a coffee like you get in Starbucks: almost at the temperature where you can drink the whole thing in one go. If you like your coffee piping hot, this is not the machine for you. There’s no hot plate on this model either. This particular model is slightly lacking in terms of design and build quality but we’ve had no issues with the machine breaking down and aesthetics are subjective so it might be to your taste. Ninja has a robust range of Coffee Bars and the CF901 is arguably the best overall value offering the bulk of functionality from the pricier machines without the tedious drawbacks of the weaker CF112. The supersized carafe enables you to make ample coffee for all the family and you can keep it warm for a good couple of hours thanks to the plate in place. This machine is strictly for use with pre-ground coffee so you’ll get the eco-friendly pod-free experience many consumers are now looking for along with the convenience of a near-instant coffee that tastes out of this world. You’ll get the same trademark 5 brewing types common to the Ninja Coffee Bar range making this perfect for families with varying palates. The integrated frother gives you even more versatility allowing you to get precisely the coffee you want without needing to hit Starbucks. The same latitude comes to the fore with sizing and you can make 6 different brew sizes at the push of a button. This is the only model in the range without a programmable brew delay but this is hardly a deal-breaker considering the shower of benefits you’ll get from a fairly modest investment. The CF080Z is another rock-solid Ninja Coffee Bar. It’s a shame they didn’t name these machines with something a little more inspiring but that’s partly why we’ve tried today to focus on the differences rather than the similarities so you can see which makes best sense for you. 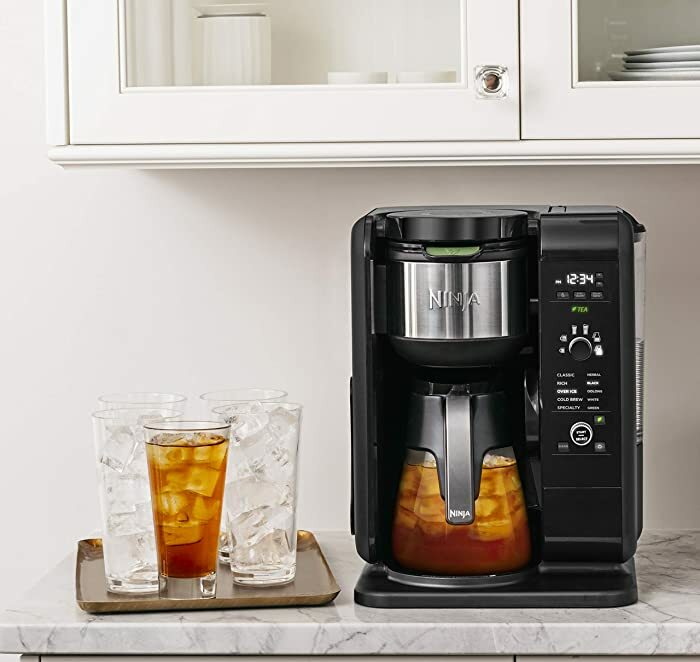 The 43oz carafe on this machine is slightly smaller than the supersized one you’ll find on the CF901 but it’s still large enough for the whole family. Although glass doesn’t retain heat brilliantly, this is mitigated by the hot plate so you’ll have hot coffee for a good couple of hours. You’ll get the same variety of coffees at your disposal as with all these Ninja Coffee Bars. Whether you prefer it hot or iced, long or short, choice is impressive. Setting aside the ongoing cleaning indicator snag that blights these Ninjas, cleaning and maintenance is a breeze. If you’re looking for a robust and flexible way to enjoy gourmet coffee without endlessly tinkering around, this model is tailor-made. Rounding out our best Ninja Coffee Bar reviews, we’ve got the CE201, another unimaginatively named machine that packs the same punch as its stablemates and comes in at an incredibly keen price point. You’ll get a huge carafe capable of holding fully 12 cups of coffee and if you don’t have such heavy needs, you can easily brew in smaller batches. The pause function comes in handy if you want the best of both worlds so you can set a whole carafe to drip through but grab a quick cup on the fly before it’s completed the cycle. Programmability with the valuable auto shut-off for safety’s sake gives you a great deal of convenience while you can take full advantage of the precise warming plate and enjoy your coffee remaining hotter for longer. If you’re not a tea fan and you’re not bothered about iced coffee, this makes an outstanding choice for the best hot coffee on a budget from a brand you can rely on. We trust these snapshots of the best Ninja Coffee Bars has given you a clear idea of which machine would be the most suitable addition to your kitchen for 2019. There really is no single machine that’s better than the others, it’s very much of a case of being honest about your needs, the type of drinks you enjoy most and how much space you have to accommodate the machine. Of course, budget is also always a factor but all of these machines are great value so that needn’t be your prime motivator. Well, the only question that remains is which Ninja Coffee Bar has your name on it?